Why put unnecessary holes in your walls with nails and screws when you can easily mount this 3M Command Hook 24-Pack to any wall without tools and without damaging your wall's paint? 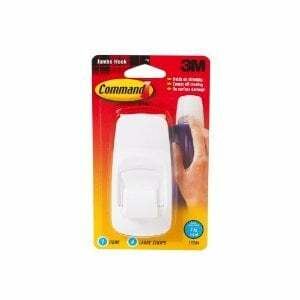 This 3M Large Command Hooks can hold inline water filters to your wall, refrigerator, or other appliances as well as brooms with handles, towels, rags, cleaning tools, bath robes, coats, pictures, and much more - it can be used to hold up just about anything with a hook or a loop that weighs up to 7.5 pounds. 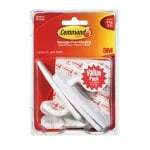 This 3M Command Adhesive Hook uses a Command Adhesive that sticks strong enough to hold up to seven and half pounds, but it removes cleanly and will not scuff up your wall. Weight Capacity: About 7.5 lbs. 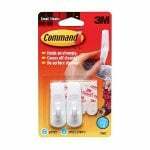 These 3M Command Wall Hooks are perfect for holding up in line filters, organizing clutter, or decorating around your house. 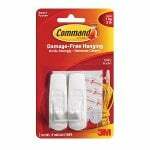 This package includes one 3M Command jumbo hook and four Command adhesive strips.